I hope everyone is enjoying their holiday weekends, be it celebrating July 1 or July 4. I was telling my Mom about my low-key Canada Day plans…. WHAT? !, she exclaimed. All the grocery stores are closed here. True, the big chain grocery stores were closed on Friday, but that didn’t stop Sunny’s (or Bestwin or even T&T) from being open. Sunny’s, my current favourite grocery store, is located in Flemingdon Park, the Toronto neighbourhood with the highest percentage of immigrants (67% of its residents, with 23% recent immigrants). Sunny’s advertises over 10 languages its staff can speak, and it truly offers a multicultural grocery experience. Due to its local clientele, the prices are great and the produce is fresh. And it was open on Canada Day. Hourray for me! BBQs are in full swing now at our place, even though we are still living out of boxes. Rob has chosen to take full advantage of the barbecue, grilling up various kinds of meats for guests, whereas I typically reign in the salad department. 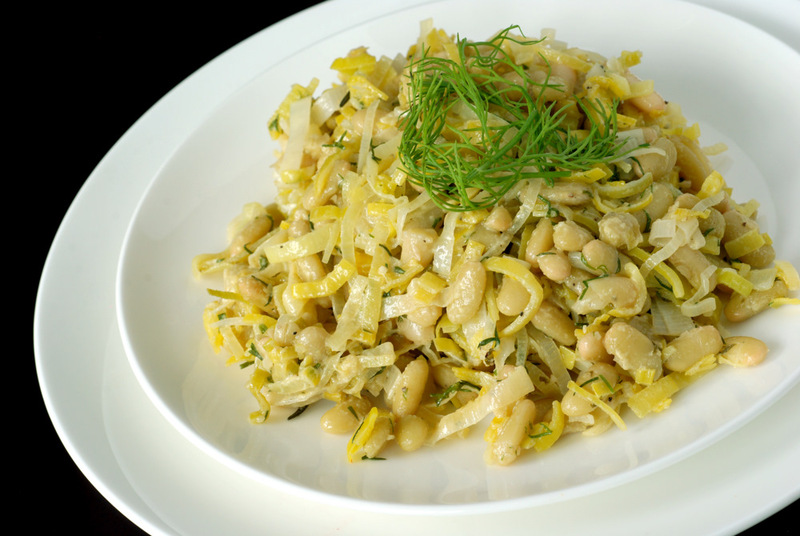 I have revisited some of my old favourites, and of course, tried out a few new ones that will be shared shortly, including this lovely warm leek and white bean salad. 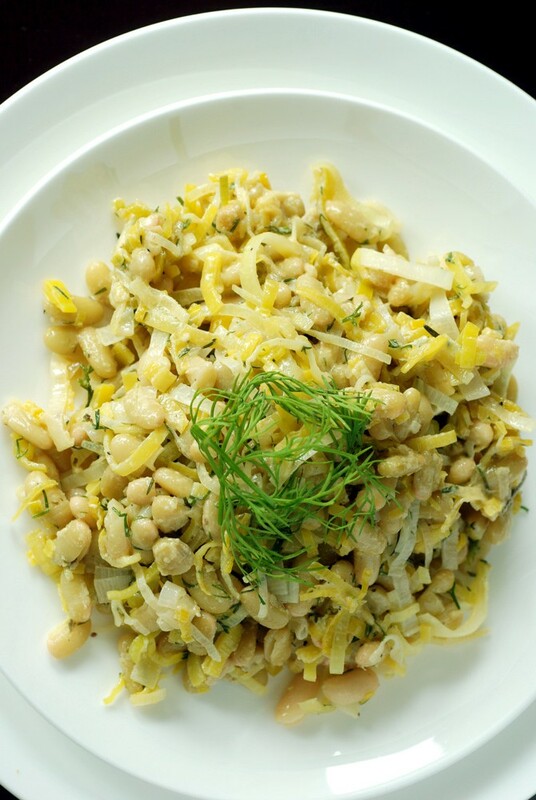 White beans are combined with caramelized leeks and smothered in a light mustard sauce. I was mostly inspired by the recipe from Waitrose since I adapted it quite a bit. I increased the amount of leeks, used dill instead of parsley, added in lemon pepper and simplified their mustard dressing. I like how creamy dressing can get with mustard alone! You can bring your bean salad to the next level by cooking up your own beans with complementary flavours. Here, I opted to cook my own flageolet beans in vegetable broth and rosemary for additional flavour. Cook up more beans than you need, freeze the extra with the stock and you can whip up another tasty white bean salad in a heart beat. Tinned beans would work too, if you haven’t yet converted to cooking your own beans (I had a hard time locating dried flageolet beans in Toronto, let alone canned flageolets, though!). While you could use any white bean (cannellini/white kidney, Great Northern, or even something smaller like navy or black eyed pea, etc), after delving into my heirloom bean collection, I have realized wonderful novelty beans can be! The first bean I tried was the green flageolet. I found it locally at Rube’s Rice in the St Lawrence Market, so thankfully I can easily replenish my pantry (instead of outsourcing my supply from the US!). Flageolets are smaller white beans, but deliciously smooth and creamy. They are commonly used in the French cassoulet, but here, they make this salad shine. I look forward to trying other ways of using these delicious beans over the summer. This is my submission to Deb for this week’s Souper Sundays, to this month’s My Legume Love Affair, hosted by Susan and to this month’s Simple and in Season. 1. Drain soaked beans and rinse well. Combine rinsed flageolet beans, broth, bay leaves, and rosemary in a medium pot and bring to a boil. Once boiling, reduce to a simmer. Cook until tender, this was around 80 minutes for me, but start checking after an hour. Once at their desired consistency, remove bay leaves and rosemary. Drain beans and set aside to cool. (Save that liquid you just drained, it would be a fabulous vegetable broth). 2. Once the beans are cooling, heat 2 tbsp of oil in a large frypan over medium heat. Add the leeks and salt. As soon as the leeks begin to soften, turn down the heat fairly low and continue to cook for 10 minutes, stirring from time to time, until they are soft (don’t let them take on any colour). 3. Add the beans and toss together until heated through. Take off the heat; stir in the dill and lemon pepper. Season to taste. 4. For the dressing, whisk together the mustard, vinegar and remaining 3 tbsp oil and season well. Stir into the pan of warm leeks and beans, just prior to serving (I found the dressing was soaked up a lot when eaten as leftovers, and I preferred it freshly dressed). Your barbecues sounds like my barbecues! My family eats meat off the grill while I am perfectly happy munching on salads like this! The leeks here must give such a nice buttery flavor to the dish and I love the sound of that mustard dressing! Happy Canada Day! Delicious bean salad! I would love this, such great flavor in the dressing! I love anything beans and this looks perfect with the leeks and that mustard dressing. Yum! Thanks for sharing it with Souper Sundays this week. 😉 Happy Canada Day. Hey, it’s not just meat that I’ve grilled. Now I’ve grilled pineapple and asparagus! this is such a lovely salad recipe- looks yum ! Simply filling and nutritious salad..
how do you do it? i’ve never heard of flageolet beans before, but this salad just looks so FREAKIN good! I love the sound of this as a light summer dinner. Definitely on my list for this week, can’t wait!! It may be warm, but it hits the spot for summer eating. A very lovely salad and a great addition to July’s MLLA collection of recipes. Thanks, Janet, for joining in. This looks really good and then I saw that it has mustard and was hooked. This sounds like such a yummy and flavourful bean salad. I don’t know that I’ve seen flageolet beans anywhere though I’m sure I could find them if I went looking. This looks sooooo good! Thank you so much for entering it into Simple and in Season. Round Up to follow later. Yes! I have indeed seen the Flageolets in French casserole dishes! A great idea to use them to make the salad shine! The pictures make this dish look delicious! Good to know they are available at Rube’s in SLM. I’ve only had tinned ones which my in-laws brought back from France. I devoured them straight from the tin!